The Las Cruces Museum of Art will host marionette demonstrations during the downtown Ramble from 5 to 7pm on Friday, March 7, and at 10am and 12pm on Saturday, March 8, with Barbara Mayfield, a Santa Fe-based puppeteer known for her engaging and award-winning performances at the New Mexico Museum of Art. Mayfield Marionettes brings their beautiful creations as part of the popular wood block print exhibition, Gustave Baumann: A Life’s Journey (on view through Saturday, March 29). The exhibit includes imagery and information on Baumann’s iconic marionettes, as well as a reproduction marionette visitors can use. Baumann began creating a series of marionettes for community entertainment in 1930 when the national art market slowed due to the Great Depression, and his corps of stringed puppets performed for thousands over three decades before being retired in the early 1960s. a multimedia interdisciplinary artist, writer, Screen Actors Guild actor, comedienne, and puppeteer. Born and raised in Philadelphia, PA, she is a graduate of the Pennsylvania Academy of Fine Arts. The marionette demonstrations are free and open to the public. 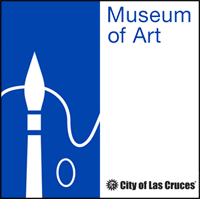 Located at 491 N. Main Street, between the Museum of Nature & Science and the Branigan Cultural Center, the Las Cruces Museum of Art is operated by the City of Las Cruces. For more information on exhibitions, art classes, and public programs, please telephone 575-541-2137 or visit las-cruces.org/museums.